I pak dau de ştire...: Rusia si Eurovisionul. Razboiul Rece. Rusia si Eurovisionul. Razboiul Rece. Russia's foreign minister has called Azerbaijan's failure to award any points to Russia's entry in the Eurovision song contest "outrageous". Sergei Lavrov said the points had been "stolen" from Russia's Dina Garipova and "this outrageous action will not remain without a response". Azerbaijan says it cannot explain how it awarded no points to Russia, when Garipova came second in its phone poll. Russian voters awarded the maximum 12 points to Azerbaijan's Farid Mammadov. Azerbaijan's President Ilham Aliyev has ordered an inquiry into how its votes for Russia apparently went missing. And the country's Foreign Minister Elmar Mammadyarov, sitting next to Mr Lavrov at a press conference in Moscow, called it a "detective story". He said records from all three of Azerbaijan's mobile phone operators show that Azeris awarded Ukraine's entry the most votes, followed by Russia's. "Where did the votes go? How did they disappear? This, of course, is a question for our public television," he said. Mr Lavrov said he and his counterpart had agreed they should take a "unified course of action" once the reasons for the discrepancy became clear. A spokesman for the European Broadcasting Union, which runs the competition, said the phone vote was not definitive. A national jury in each country also contributes 50% of the final decision, the Associated Press reports. 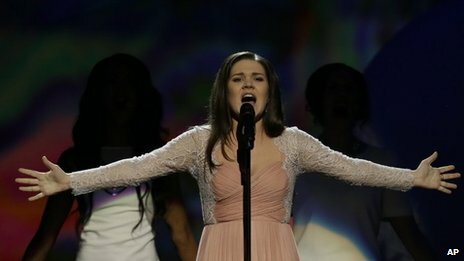 Despite the high-level political interest, 10 points for second place from Azerbaijan would not have made any difference to Garipova's fifth place, since she finished 17 points behind Norway. Azerbaijan, which hosted last year's contest, has traditionally tried to maintain good relations with Moscow though there have been tensions over energy in the past. Meanwhile, the president of Belarus, Alexander Lukashenko, has weighed in with his own accusations. Suspicious that the Belarusian singer did not receive a single point from Russia, he has claimed that the final was falsified.